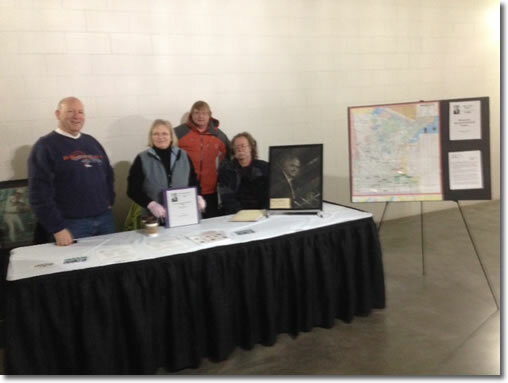 Thanks to all of you represented the chapter as volunteers at Twinsfest, including Brenda Himrich, George Rekela, Jerry Janzen, Stew Thornley, Rich Arpi, Joe O’Connell, Howard Luloff, and Lee Temanson. We had the opportunity to speak to a number of Twinsfest attendees who were interested in baseball and our organization, passed out more than 80 SABR membership flyers, met several former SABR members who may be interested in re-joining the organization, and spoke with several more who said they would like to become new members. Thanks to each of you who braved the cold to promote our organization. A special thanks goes to Brenda, Rich, and Joe for providing tickets so that the chapter would not need to buy any more than the Twins provided us for the event. Looking forward to some warmer weather and seeing you all in the springtime. At Twinsfest, the chapter highlighted its Spread of Baseball in Minnesota project, which was started by Rich Arpi and now includes contributions from a number of members. Two webpages have information on the spread of baseball, Pre-pro Baseball and Pre-pro Clubs and Games in Minnesota. For more information on getting involved with the project, contact Research Committee co-chairs Brenda Himrich and Sarah Johnson. As part of Black History Month in February, the city of Bloomington and Bloomington Human Rights Commission are hosting a baseball event on Thursday night, February 27, at the Bloomington Civic Plaza, 1800 W. Old Shakopee Road, Bloomington 55431-3027. Frank White will present his They Played for the Love of the Game, Adding to the Legacy of Minnesota Black Baseball exhibit. Other chapter members will be involved and presenting, and all members are welcome to attend and staff a table to promote the Halsey Hall Chapter. The event starts at 6:30 with the program beginning at 7:00. The Halsey Hall Chapter Book Club will meet Saturday, February 1 at 9:30 a.m. at Barnes & Noble in Har Mar Mall in Roseville to discuss Bottom of the 33rd: Hope, Redemption, and Baseballs Longest Game by Dan Barry. In addition, the group will discuss the telecast of Game Five of the 1984 National League playoffs. The complete game is available for purchase from iTunes or for viewing on YouTube: 1984 NLCS, Game 5: Cubs @ Padres. The next Fred Souba Hot Stove Saturday Morning, an informal breakfast gathering for the purpose of talking baseball, will be at 9:00 on March 8 at Bakers Square in Richfield (66th Street to the east of York Avenue). 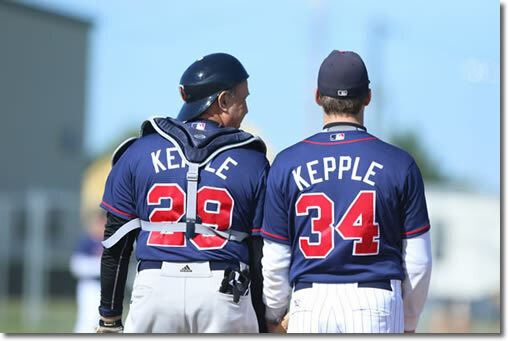 Lloyd Kepple and his son Ben were the starting battery for the Pro Pals in a 5-4 extra-inning win over a team coached by Frank Viola and Greg Gagne at the Twins Fantasy Camp in Fort Myers, Florida, from January 4 to 12. He threw hard enough that my hand is sore tonight, wrote Lloyd in a post-game missive. The Pro Pals finished 4-4 in the regular season and were seeded first in the Red Division playoffs. They won their playoff game on Friday, January 10 to advance the championship game the next day at City of Palms Stadium. However, they lost 5-2 to the Padrones. Lloyd reports, But the Pro Pals were happy. They reached their goal of being one of the four teams (out of 10) to advance to the Saturday championship games in the big stadium. Lloyd has been attending fantasy camps for two years. Bob Tholkes, Rich Arpi, and Joe OConnell are driving to Houston for the SABR convention July 30 to August 3 and have room for another member in the car. Anyone interested may contact Bob Tholkes, 763-781-6161. Anthony Bush has written an article on the return of pro baseball to Superior, Wisconsin, in 1909, 1909: Professional Baseball Returns to Superior. February 1Book Club and Vintage Game Video Club, Barnes & Noble, Har Mar Mall, Roseville, 9:30 a.m., Bottom of the 33rd: Hope, Redemption, and Baseballs Longest Game by Dan Barry and Game Five of the 1984 National League Championship Series. For more information, contact Art Mugalian, 612-721-2825, and Gary DeSmith, 320-286-5127. February 27Celebrating Black History Month through Baseball, part of The Bloomington Human Rights Commission Presents: Black History Month, Bloomington Civic Plaza, 1800 W. Old Shakopee Road, Bloomington 55431-3027, 6:30 p.m.
March 8Fred Souba Hot Stove Saturday Morning, Bakers Square, 66th and York, Richfield, 9:00 a.m. For more information, contact Mark Johnson, 952-831-1153.